Before that, you might forget about my Oita trip because much time have passed since I posted about the trip last time. So, this is the post last time 🙂 Today I post about the third day. Last day of my Oita stay. The third day, last day of Oita, I woke up earlier and got out of the accommodation. We don’t need any procedure of leaving the accommodation, we can leave the accommodation as we like. We pay when we check in. In short, there are no any staffs until noon. There are some big lockers and someone who use this accommodation can use those lockers. So, I put my baggage into the locker and got out of the accommodation. I wanted to do Jigoku-Meguri. 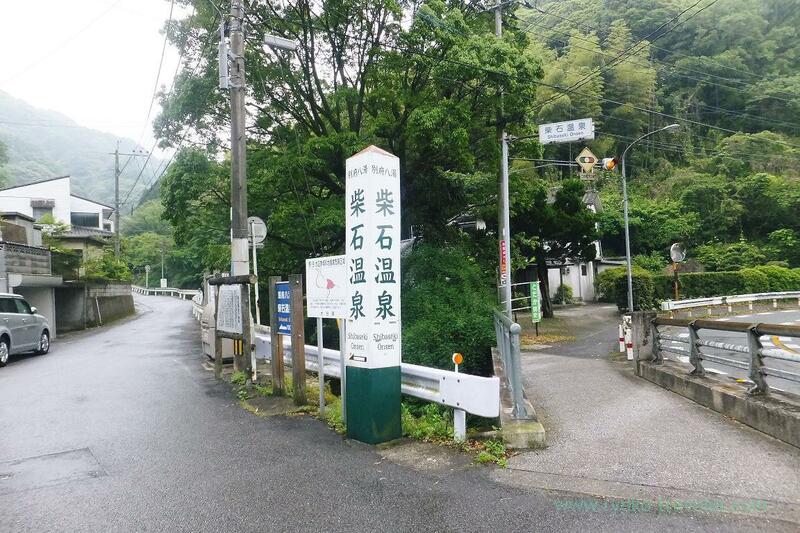 So, I went to Kannawa Onsen bus stop by bus. And then I started Jigoku Meguri (Hell-tour). 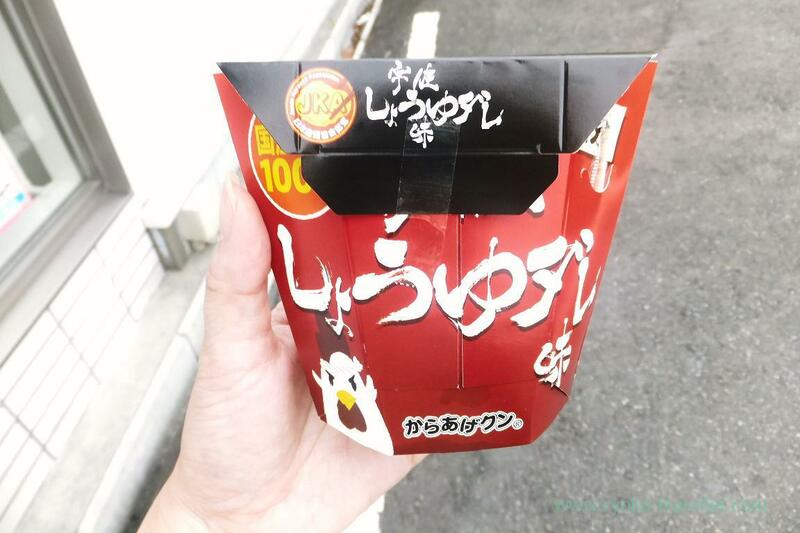 I remembered that I didn’t have breakfast, so, I bought it at Lawson that I happened to find on my way to Jigoku area. 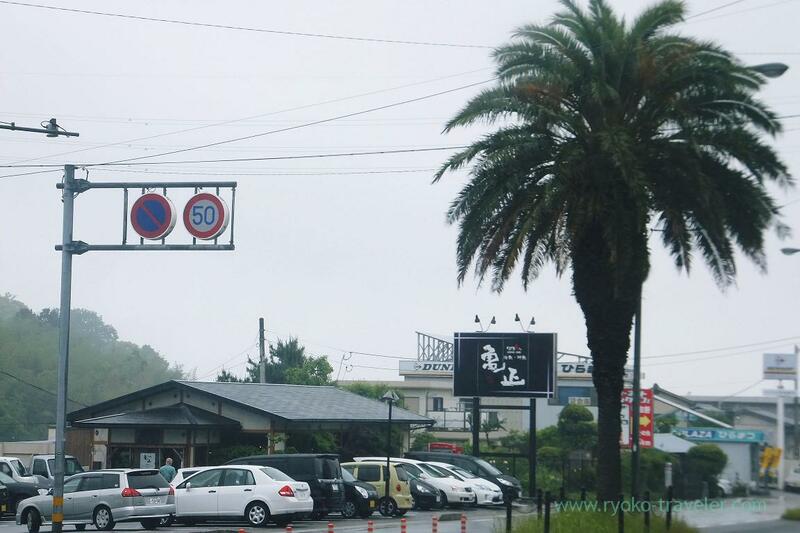 I scheduled to do Jigoku meguri, but on the way to Jigoku area, it started raining. I forgot my folding umbrella at Narita Airport, so I didn’t have umbrella. There was no shops. It was very far to go back to the Lawson. 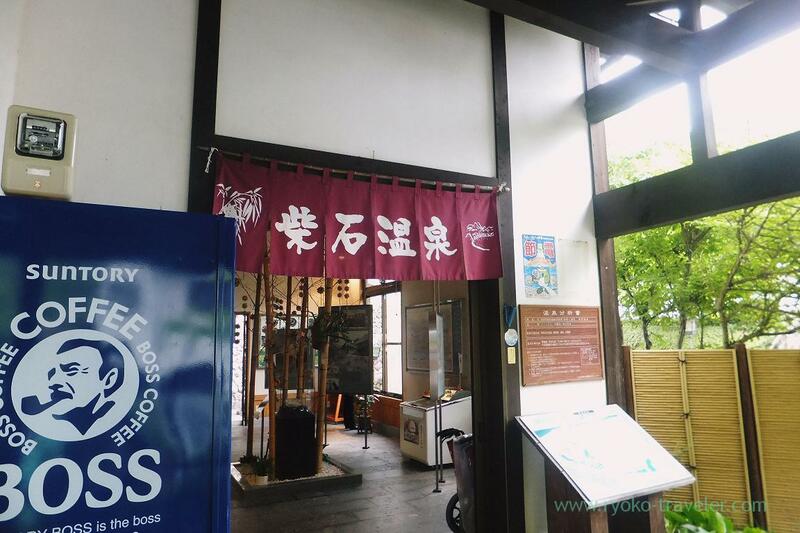 So, I decided to take the onsen and shelter from the rain. I found this onsen resource was far better than expected. It is sulfur spring and the water is white. 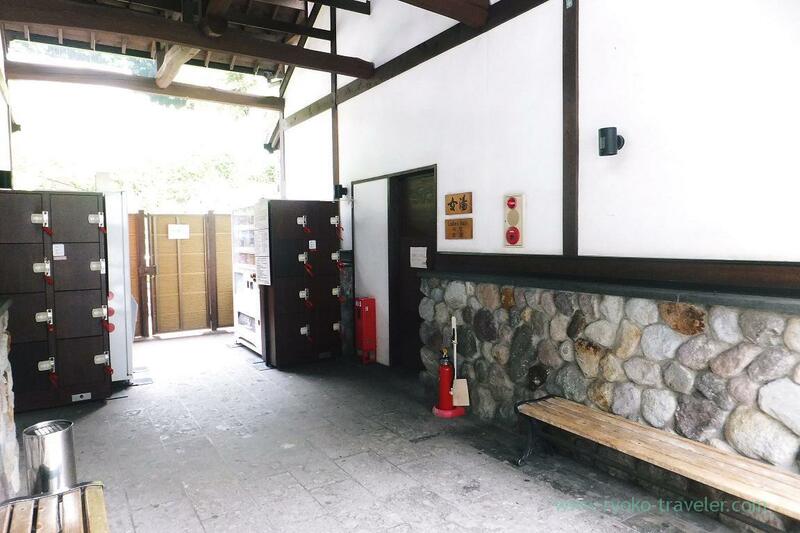 And the Steambath that is specialty of Beppu was there, too. Too hot ! I couldn’t take the bath for a long time. Lockers are cost you 100 yen. I gave up and went back to Lawson, and bought an umbrella. I found it’s already past 10 a.m.
It’s good time to walk to “the shop”. I didn’t see any “jigoku” yet ! So, I started to walk to the shop. I intended to go to this shop at any cost ! Sushi-go-round ! About 30 minutes from the Lawson. Why did I wanted to go there at any cost … ? That’s because …. 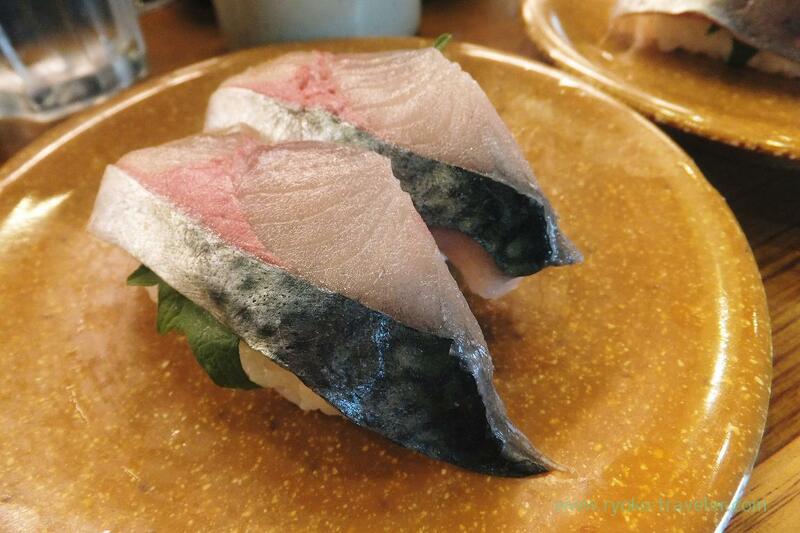 Seki Saba (Seki Mackerel, 関サバ, 360 yen) ! 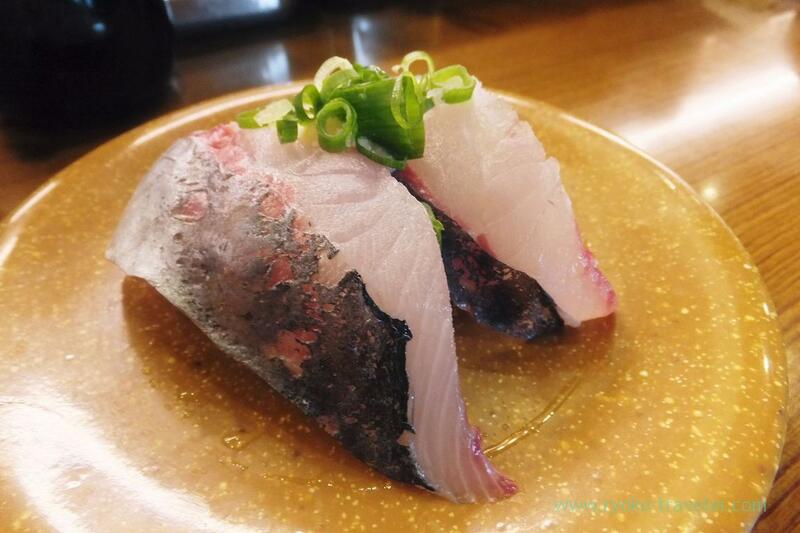 Seki Aji (Seki Horse Mackerel, 関アジ, 360 yen)! I can’t believe that such expensive fishes at lower price at sushi-go-round shop ! And those were so fresh ! Because it was seasoned slightly since they are proud of fishes’ freshness, I couldn’t find the difference between “tataki” and Ryukyu. Of course, it was fresh and tasty. 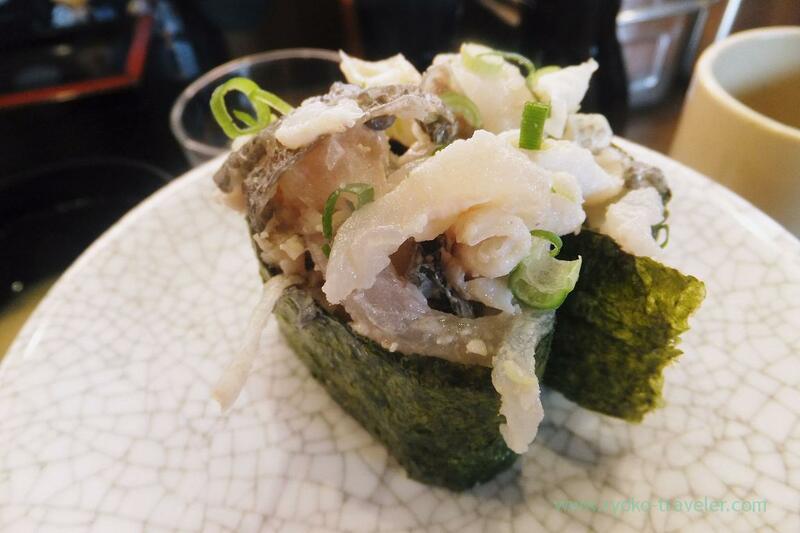 Thread-sail filefish dressed with its innards (ハゲのきもあえ, 150 yen) from Beppu bay. Hage means bald head in Japanese. I wondered what it this. I found it meant thread-sail filefish later. 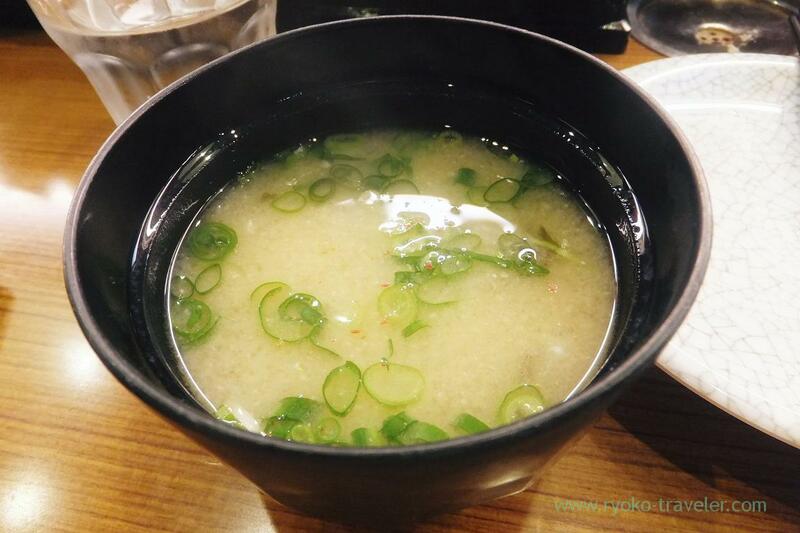 It is called “Kawahagi” around here. I examined later and found “Hage” is used around Kansai region. 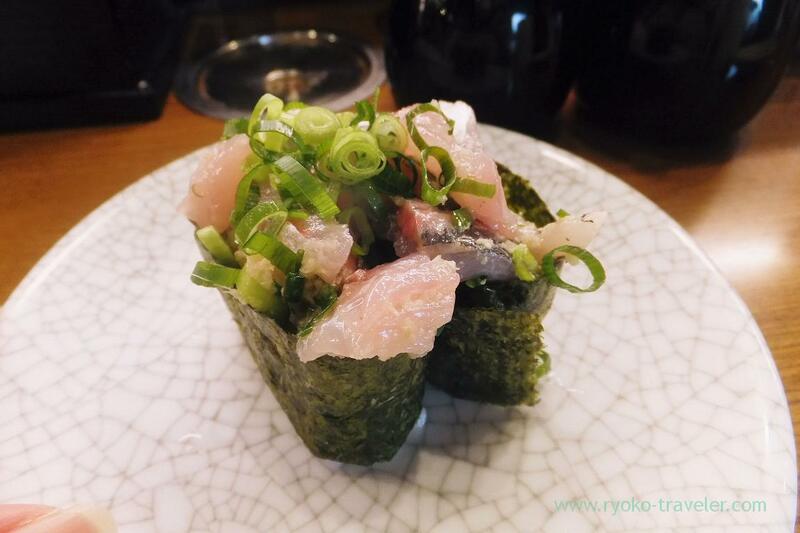 And another I ate squid, horse mackerel’s tataki and so on. They show clearly Where every fishes came from on the blackboard. That’s great ! 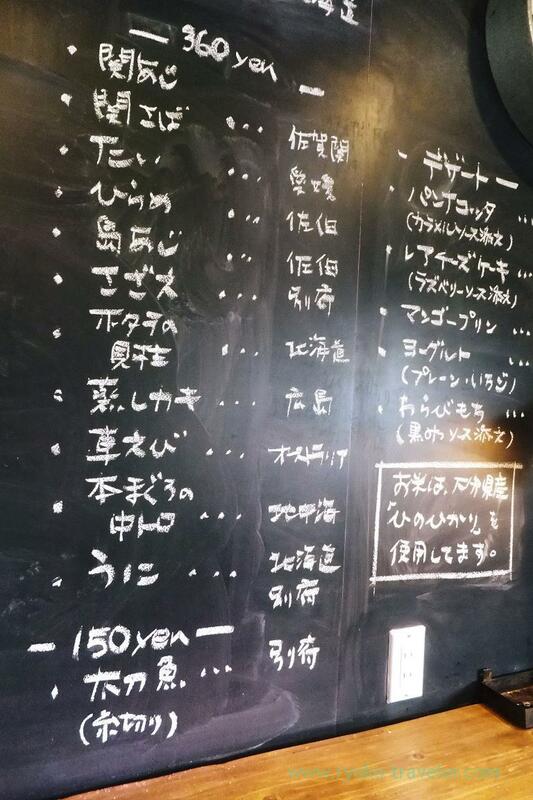 From this blackboard, I chose fishes from Kyusyu area, especially Oita ! Though I ate a lot, it cost me around 2000 yen in all 🙂 Then I started to walk to Jigoku area again !